Eco-style is a recent popular trend. It's all about being closer to nature: natural materials, nature-inspired shapes and the absence of excessive unneeded elements. Modern eco-style originates from progressive Scandinavian designers and Japanese traditionalists. Nordic people traditionally prefer to work with natural materials like wood, and not with plastic. Scandinavian architecture is also dominated by eco-style. As for the Japanese, eco-style is the real mode of their life. It's the essence of Japanese culture. So, if you get tired of the concrete urban world, pitch upon eco-style for your home. Get some wooden furniture - and I mean real wood, not the ubiquitous particle boards. 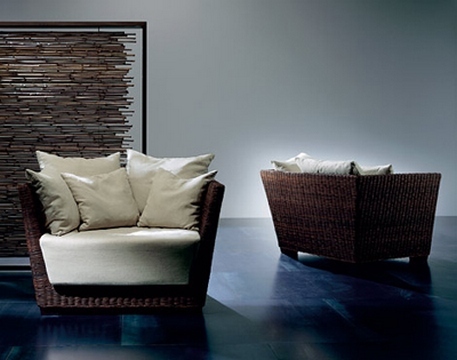 Another nice eco-material is wicker, which looks especially great on tiled floor surfaces.